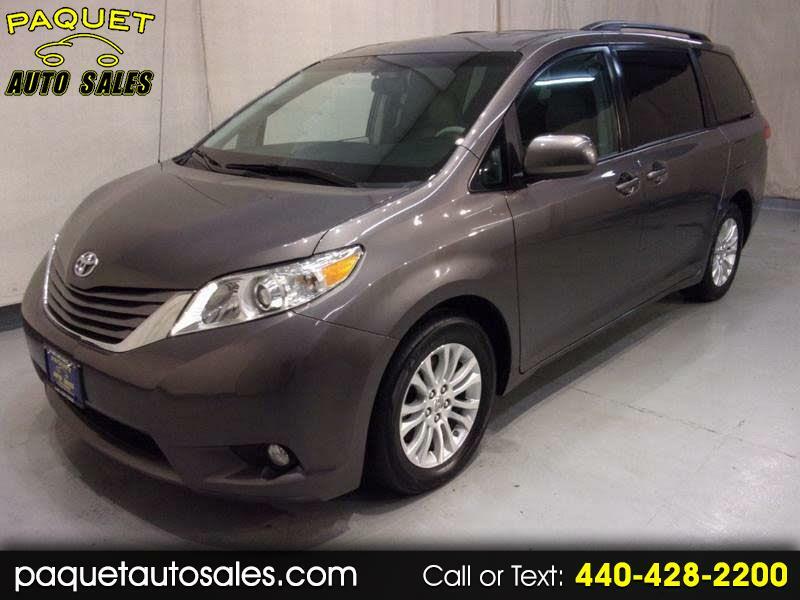 3RD ROW SEATING---ONE OWNER---LEATHER AND SUNROOF---BACKUP CAMERA---BLUETOOTH AND HANDSFREE PHONE CAPABLE WITH VOICE COMMAND--- 2013 TOYOTA SIENNA XLE in a gray metallic exterior finish with power sliding doors with power windows and remote operation, rear window sunshades, luggage rails, fog lamps, power rear side vent windows, body color door handles and rear roofline spoiler with 3rd brake light, body color folding heated exterior mirrors, power pop up rear hatch with wiper and remote operation, tinted rear windows, traction control, automatic headlights, alarm system, chrome grill surround, keyless entry with multi-function remote. Inside you will find a nicely equipped gray leather interior featuring powered and heated front bucket seats with headrests and armrests, center console/beverage holder, power windows, door locks and exterior mirrors, overhead sunglass holder with reading lights and conversation mirror, digital compass, clock, external temperature and vehicle information display, dash mounted cupholders, dual lit vanity mirrors, dual glovebox, air conditioning with rear air, CD/Satellite ready radio with Bluetooth and aux. inputs, tilt and telescopic steering wheel with mounted cruise, stereo, phone and voice command controls, carpet floor mat set, 2nd row sliding bucket seats with armrests and headrests, 2nd row center console with removable jumper seat, 2nd and 3rd row cupholders, folding split 3rd row seat with headrests, cargo area light and power outlet, rear defroster. Fully inspected by our service technician. Detailed inside and out and ready for delivery. Stop in or call today and speak with one of our friendly sales staff with any questions that you may have. See more photos at our website www.paquetautosales.com.